Samsung's Galaxy Note8 had four initial launch colors: Midnight Black, Maple Gold, Orchid Grey, and Deep Sea Blue. However, not all of them have been available in all countries, with most territories in fact getting only a selection of two of them. That's slowly starting to change, it seems. 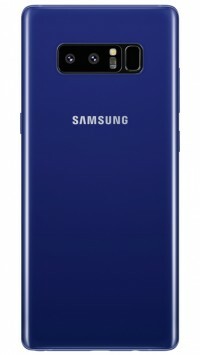 Today the Deep Sea Blue version of the phablet went up for pre-order in Germany through Samsung's online store. Initially, the Note8 was only offered in Midnight Black and Maple Gold in the country. Now if you have a spare €999 lying around you can pre-order the Deep Sea Blue iteration, which is set to start shipping on October 26. Since this color is headed to Germany, we're pretty sure we might see it in other European countries very soon. On the other hand, if you are on that continent and are holding out for the Orchid Grey hue, here's some bad news: Samsung has already confirmed that this particular variant will never be sold in Europe. My eyesight is good but you are either blind to see or not very clever to understand. Ugly ? Think of the bezell king the iphone, where you been all these years with your ugly comment whilst that frankenstein no screen all bezell freak lived. Urgggaya. Sorry its not uglyest but correctly UGLIEST. Phone is so ugly that even Nokia 2110 looks much Much MUCH BETTER.